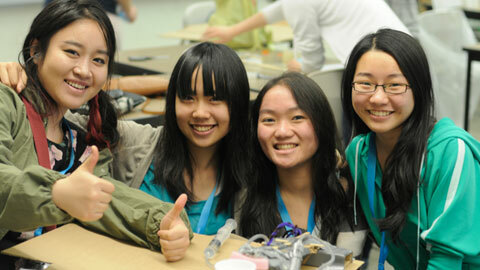 Angela Hu (left) was one of 95 participants in this year’s Girls Leadership in Engineering Experience event organized by U of T (Photo: Natasha Johnston). When Angela Hu (TrackOne 1T8) was a little girl, she would often wonder what was happening on the inside of machines. Fueled by this curiosity, she went on to pursue math and science courses, achieving high grades that led her to U of T Engineering. 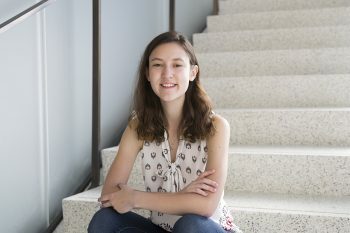 On the weekend of May 24-25, Hu travelled from Charlottetown, Prince Edward Island to the University of Toronto to join 95 other female students at the Girls Leadership in Engineering Experience, also known as GLEE. Now in its third year, GLEE is hosted by the Faculty of Applied Science & Engineering to welcome female high school students to the engineering community. Currently, approximately one-quarter of the Faculty’s undergraduate students are female. Over the course of the 30-hour event, attendees were immersed in the dynamic and passionate environment at U of T Engineering. They had the opportunity to meet future classmates, attend a career panel, take part in hands-on engineering workshops and stay overnight at Victoria College residence. “When I was a young girl living in Uruguay, I was fascinated by how things worked. I thought there were people inside our radio singing and talking – so one day when my parents were away, I opened it and found there were no little people, but vacuum tubes and capacitors and other old-fashioned electronics. We might call this my first failed experiment! During dinner, Professor Angela Schoellig from the University of Toronto Institute for Aerospace Studies (UTIAS) gave a keynote address, sharing her research on robotics, controls and machine learning. She also demonstrated one of her flying robots.